TestNG has very good feature to enable or disable selenium webdriver @Test method. During test execution, If you do not wants to execute specific @Test method from test class then you can directly disable It using TestNG property enabled = false. It Is something like excluding @Test method from execution as described In THIS POST. Let us try to Implement It practically. 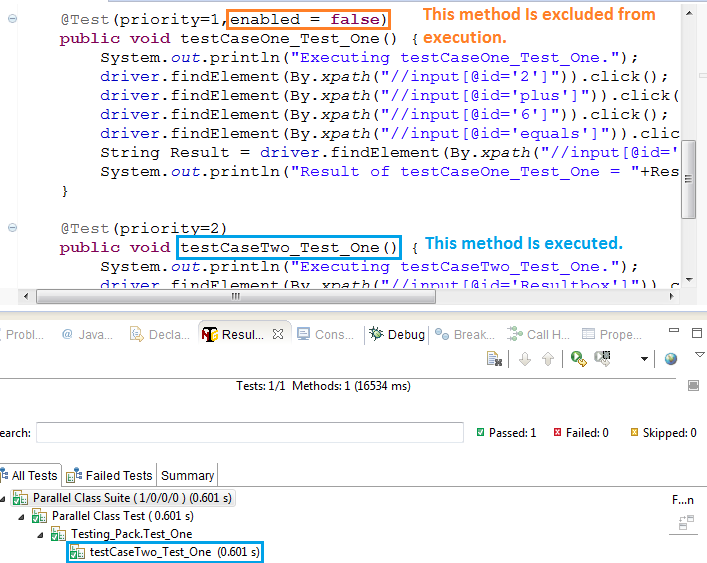 In bellow given test case, I have used @Test(priority=1,enabled = false) with method testCaseOne_Test_One(). Here, enabled = false property Is used for disabling that @Test method from execution. Create bellow given test class and testng.xml file In your eclipse and run It. Test execution result will looks like bellow. If you can see In bellow Image, only testCaseTwo_Test_One() method has been executed because testCaseOne_Test_One() @Test method Is disabled so TestNG will exclude It from execution.